with Kelly Klassen, TPI, Rosthern, Sask. Where were you born? In North Vancouver. I’ve been in Toronto for 20 years now – I met my now-husband on a fam to Zimbabwe and moved to Toronto so we could be together. What was your first job? When I was 14, after school care. In 1982 I got my first travel job when I was 18, helping out in a local travel agency, stamping brochures and so on. I remember the excitement when we got our first Reservac machine. And the OAGs! The OHRGs! Tell me about your first airplane ride. When I graduated from high school and my girlfriend and I flew Wardair to Hawaii. It was my first hotel stay as well! How has the business changed since you got into it? Oouf! Tremendously. The biggest is with the airlines: you used to have a great rapport with them, with your rep, they would do you favours. Now there’s no rapport. But on the plus side the business is much better for specialist travel advisors. What is your specialty? 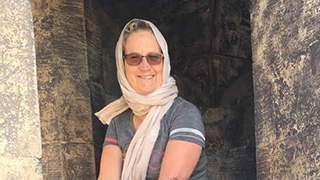 I do all small groups, many to Egypt (I partner with a few Egyptologists here in North America) and a hiking/trekking trip every couple of years – I’ve escorted groups to Kilimanjaro, Anaapurna in Nepal and Peru. The other half is private tours all over the world. I’ve got a great network of people on the ground and I only deal with people I know. My clients? They are all over North America. If you could have any job in the business what would it be? Designing itineraries for adventure travel. If I could do just that I’d be pretty happy.But I also love escorting tours. What was your best fam? Last year, to the amazing Mashpi Lodge in the Cloud Forest in Ecuador. Zero environmental footprint – phenomenal! Who do you most admire in the industry? Darrell Wade, a co-founder of Intrepid Travel. They stay true to who they are. What drives you crazy? Airlines. Yup. Do you have any time management strategies? I get up early so I can deal with my guys overseas chatting live with them. That saves me a lot of time. What do you do to keep your clients loyal? Be truthful. That’s the main thing. If you had to spend six months in a destination, which one would you pick? Southern Africa. If you weren’t doing this, what would you be doing? I would be working with dogs, with animals. In another life I think I might have worked in a lodge in Africa - my idea of heaven! If you or someone you know is a front line travel agent in Canada and would like to be featured in Biting Questions, please contact us.